Pronounced keen-wah, quinoa is one of the hottest items nutritionally and on its way up in popularity. 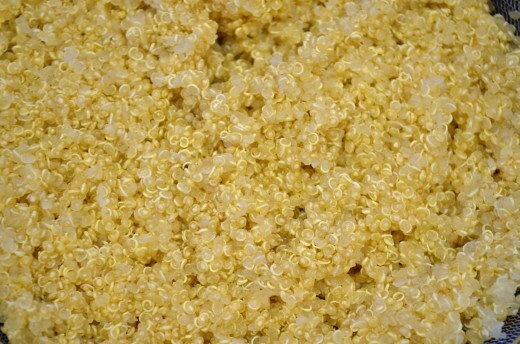 In fact, 2013 has been named by the United Nations as The International Year of Quinoa. What's all the hype about quinoa? This food, considered a whole grain by most, is actually a seed. It's considered a whole grain because it can be prepared much in the same way as other grains like rice. For instance, you can cook quinoa the way this article demonstrates, or you can cook it just like you do rice in a rice cooker. Quinoa goes all the way back to the Incas. 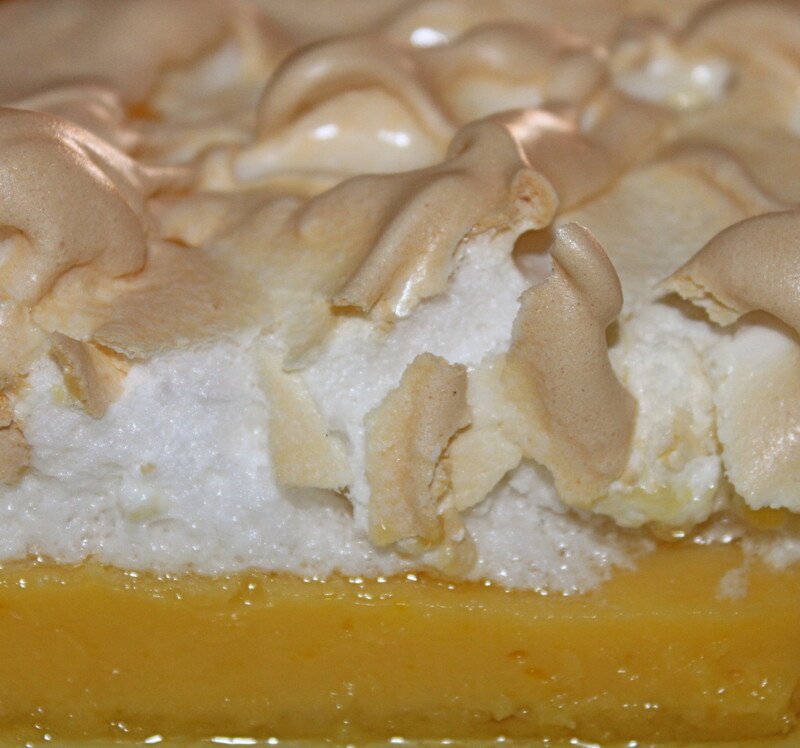 It was their staple food for thousands of years as it grew profusely in the Andes. It was coined "the mother of all grains" by the Incas and was believed to be a sacred crop. The conquering Europeans pronounced quinoa food fit only for barbarians and banned its cultivation for periods of time. The Incas instead grew wheat. The plant itself is said to look much like a tumbleweed. It's an annual plant that develops seed in varying stages on the same plant. For that reason, cultivating it by machine is impossible as each "bunch" of seeds on the individual plants has to be harvested just at the right time to be useable. So harvesting is done by hand. There has been a push to create more uniform quinoa plants so that this process can be automated to farm equipment, however, thus far, quinoa remains very much hand picked and processed. Red quinoa and the more beige or yellow quinoa are the two most often seen. The plants are suitable to growing in high mountain desert climates where the nights can dip to as low as 25 degrees and the days soar to the 90s. Quinoa is rather hardy in that it isn't ruined if there are summer frosts. The only time frost can damage the plants is when they are flowering. What Makes Quinoa So Healthy? As quinoa gains more and more exposure, people are asking what the big deal is about quinoa. Most people have heard that it has some unique properties and that it's "good for you" but beyond that, most of us don't know much about it. I know I didn't before I had some in a restaurant, thought it was absolutely fabulous and decided to do some research on cooking it myself. The research I found made it definitely one of my new favorites! Make sure you always rinse and drain quinoa before cooking. Although they say that most quinoa on the market has been pre-rinsed and dried, it's a good idea to measure your quinoa into a wire strainer, then rinse several times with cold running water and let drain. This releases any remaining saponins which are considered mild toxins. They are not poisonous but should be removed as much as possible from the grain. Saponins can also alter the flavor of cooked quinoa if you skip this process, making it more bitter. 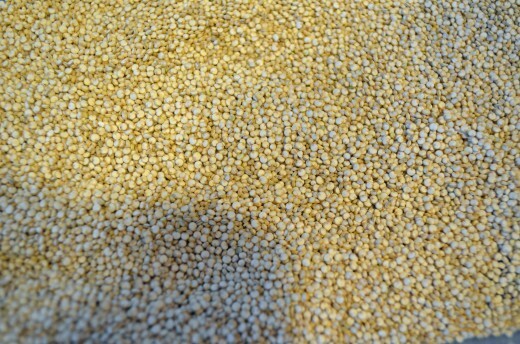 If you rinse the quinoa, you may see lots of gold or yellow rinsing off the seeds. That's the saponins being washed away. If you're like me and decide to take a wee bit of a bite of the quinoa before cooking in its dried state, you'll find it tastes (probably) very similar to birdseed! 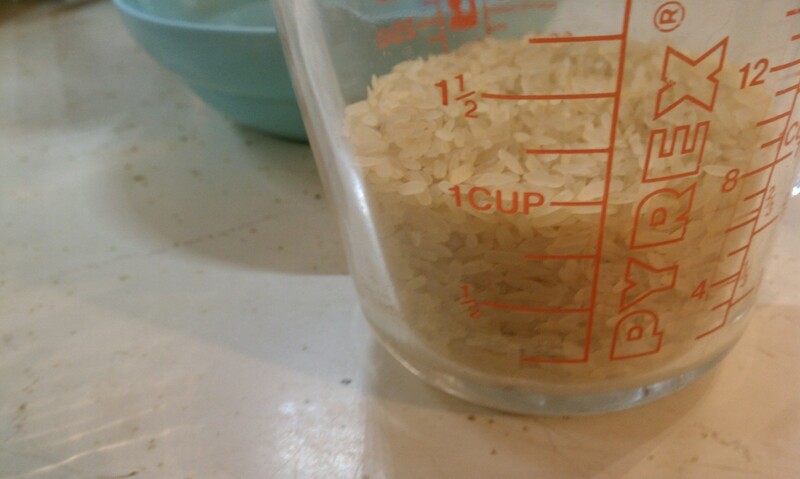 When cooked, use as you would regular or brown rice or couscous. 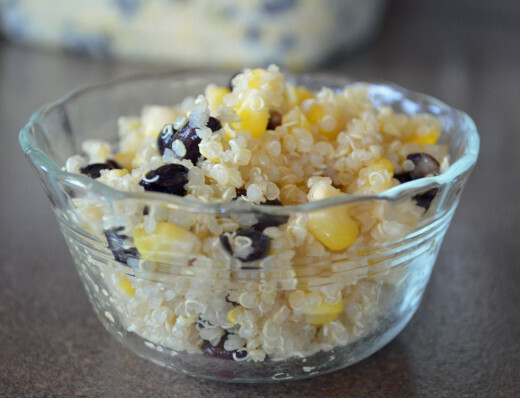 Serve as a side dish or combine in other dishes such as quinoa, corn and black bean salad. Step 1: Rinse the quinoa thoroughly under cold running water. Use a metal strainer with very tiny holes as the seeds are about the size of millet (a type of birdseed or cereal). This removes the saponins. Step 2: Put a pan of water on to boil. 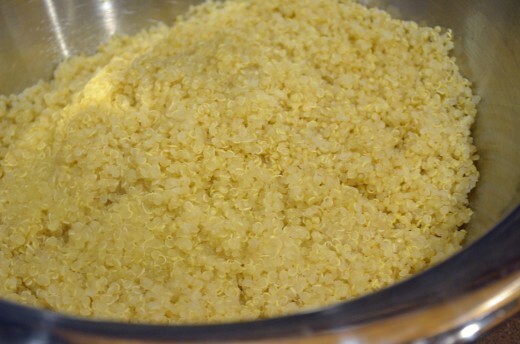 When it reaches boiling, add the rinsed quinoa and return to a soft boil. Boil for 10 minutes. Drain in strainer or sieve. Once cooked, the quinoa will have opened the seed and assumed its traditional "curl." After cooking partially, quinoa should have its trademark "curl"
Step 3: Fill pan again with low level of water and bring to a boil. Set metal sieve (preferably one with a handle) over the boiling water but not allowing the quinoa to be submerged in the water. 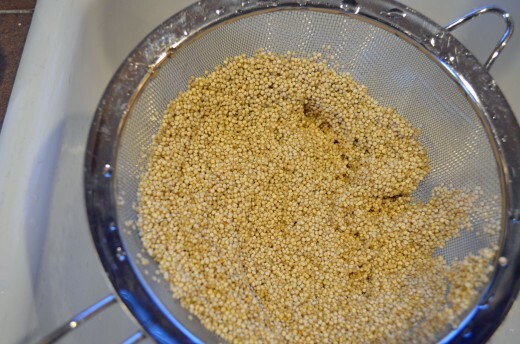 Place a clean dish towel on top of the quinoa in the strainer or sieve and fold ends up to keep from flames/burner. 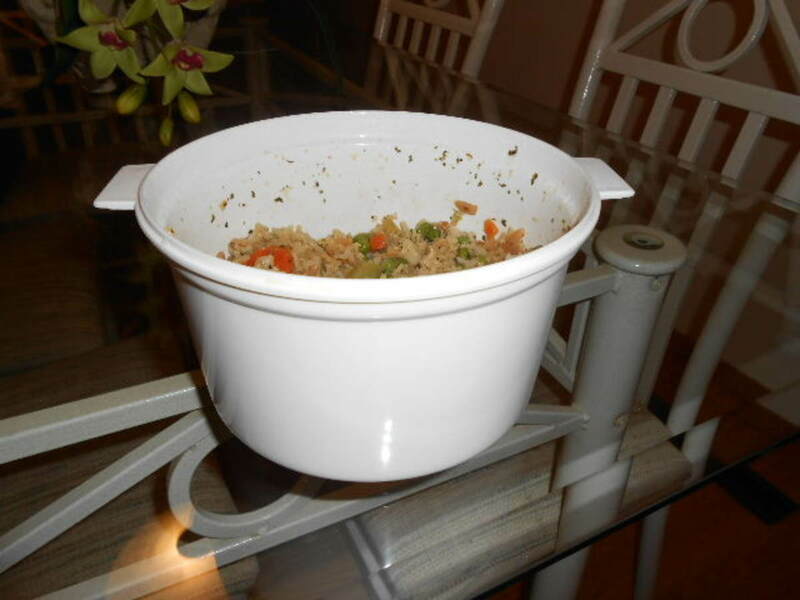 Top with a lid. Cook/steam for 10 minutes. Add more boiling water to the pan if necessary if the water boils away. 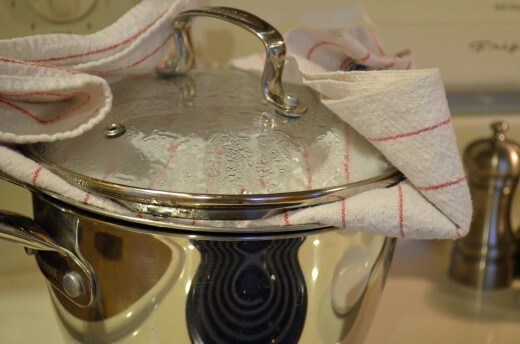 Cook quinoa in a sieve with a clean dish towel under the pan lid to steam grain. Step 4: Put cooked quinoa in a large bowl and let cool. Fluff with a fork. Some people like it with a dash of sea salt, a sprinkle of olive oil and a dash of lemon or lime just "as is." There are many different ways that you can cook this wonder grain. 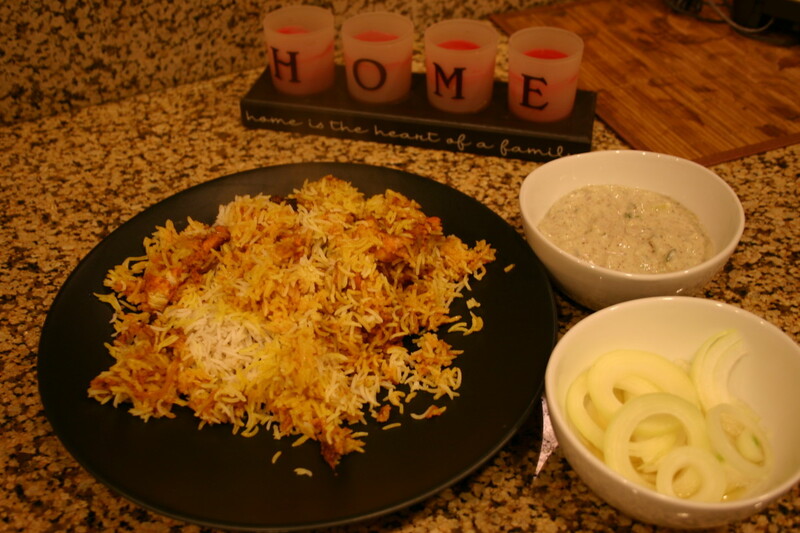 As mentioned above, you can cook it just like you would rice or even barley. The water/grain ratio is 1 cup of quinoa to 2 cups of water. Try cooking it in your rice cooker. There are also recipes on-line for cooking it in the microwave. Try it as a pilaf or even as a breakfast cereal topped with fruit and nuts. Quinoa is definitely a well rounded whole grain that's packed with nutrition--and tastes great. I think the calorie count is in line with other whole grains. I haven't tried quinoa but you've definitely made me interested in this grain! Voted up and pinned. Thanks so much, Helen - I'm not sure about the accolades - maybe I missed something in the apprenticeship---better look~~~ I agree with you though - a little grain that packs a lot of punch! Hi Audrey - you received a well deserved accolade for this hub through the apprenticship programme - well done and the hub deserves it. I have to be honest and say that I knew the name quinoa only very slightly and knew nothing about it's nutritional value, I didn't even know you could cook it!! So imagine my suprise and delight to learn so much about it in your hub. 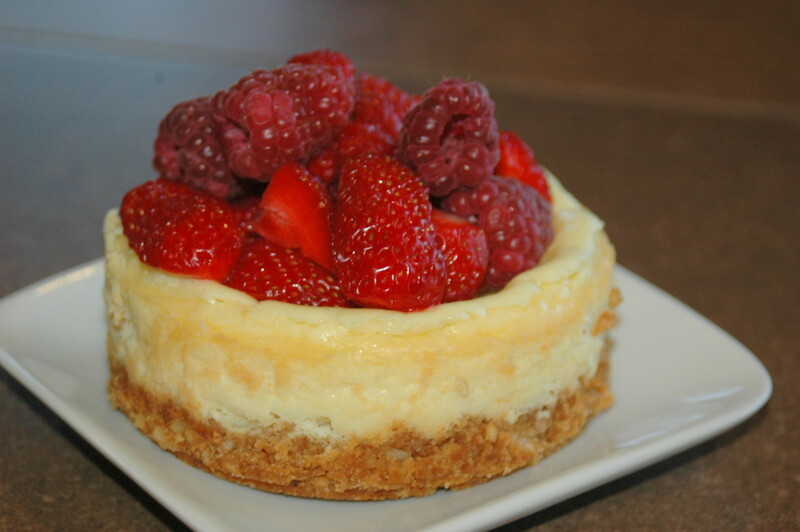 The nutritional value of this food is fabulous and to look at it you wouldn't think that it would pack so much goodness into such a little package! An excellent and very interesting hub + voted up and shared!! Well, I never . . . Never ate quinoa, that is. Now I will have to try it, Audrey, after your more than sterling recommendation and researched information, m'dear. Thank you. An excellent hub on one of my favourite foods! You covered just about everything there is to know about quinoa, well done! I buy Bob's Red Mill Quinoa which is pre soaked/washed and makes it so much more convenient! Well, I sure see the nutritional value of quinoa but I am surprised at its caloric density! 160 calories just for 1/3 of a cup sounds big, but then again, all whole grains are that way... I have a packet of millet in my pantry and this hub reminded me I need to start experimenting with it. Thanks for the tip on rinsing, I almost never rinse my whole grains but I really should, and after reading this information, I definitely will.